Sorry about the long break — I just wish I could tell you that it was because I’d been completely unable to find any awful examples of the pink/blue ‘colour bar’ in kids’ stuff. Sadly the truth is quite the reverse: there seems to be more of this crap every day, it gets demoralising, and I run out of new things to say about it. But I still think the thing I’m saying — over and over again — is worth saying; so here we go, diving into the two-tone torrent once more. 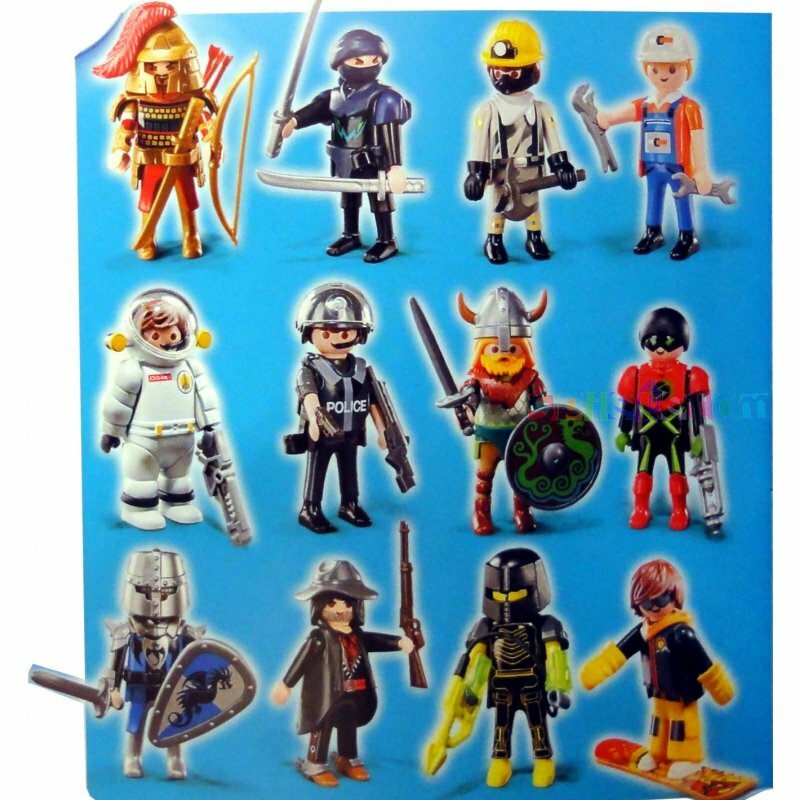 Blue set (names as listed on miniaturetrading.com): Samurai, Ninja, Miner, Mechanic, Spaceman, Police, Viking, Space Hero, Blue Knight, Bandit, Yellow Alien, Snowboarder. … and in the pink corner. 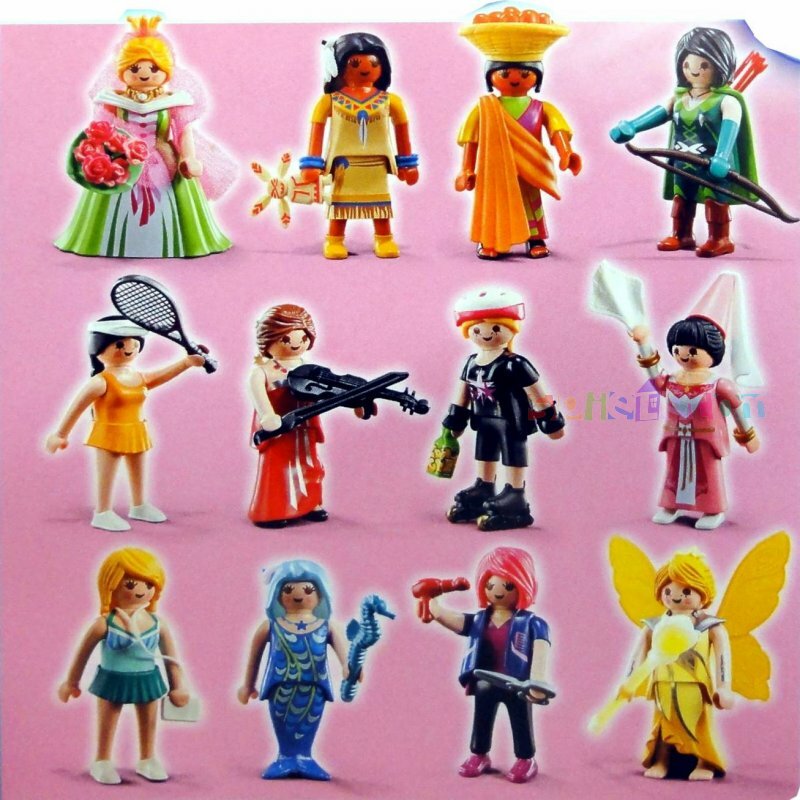 Pink set (names as listed on miniaturetrading.com): Green Bride, Indian, Asian Woman, She Elf, Women’s Tennis, Violinist, Skating, Medieval Lady, Runner, Siren, Hairdresser, Yellow Fairy. It’s pretty much what you’d expect (at least if you’ve been looking at this stuff for as long as I have): all of the male roles except ‘Yellow Alien’ are active, related to what they do; 7 out of 12 of the female roles are just about being female (with an added layer of racial/cultural stereotype on top of that for some of them). 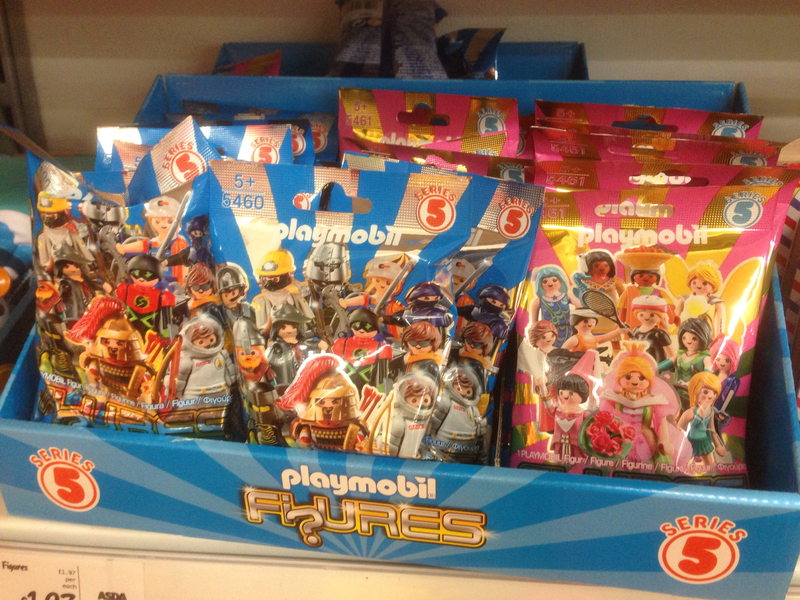 For me, though, the really depressing thing about this (apart from the fact that Playmobil, like Lego, used to do cheerful smiling minifigs with no obvious gender cues) is that while on the surface the pink/blue colour-coding just denotes the gender of the figure in the bag (in case that’s the main thing you care about for your play figures — remember you can’t choose a specific character), it’s quite clear if you look around the rest of the toyshop that the colour-coding always denotes who the toy is for. So in this case the message is clear: girls play with figures of girls, boys play with figures of boys, and never the twain shall meet. This makes me particularly angry at the moment because my daughter (age 3) has recently started saying things like “we didn’t want to play with [name] because he’s a boy”, and “I don’t like George [Pig] because he’s a boy” (I think she’s partly just parroting a good friend of hers who comes out with stuff like this all the time). Most of her friends are girls, and that’s partly just accident (the friends of mine who had kids around the same time all have girls; girls vastly outnumber boys in her class at nursery) but when she says things like this I cry a little inside. Sometimes I ask her if she can tell me why she doesn’t want to play with boys, and sometimes I gently remind her that Daddy’s a boy, and her friend [name] at nursery is a boy, and they’re fun to play with aren’t they? I don’t know how much difference it makes: I’m swimming against the tide. But given that she’s apparently already got people telling her that girls don’t play with boys, I could really do without a multi-million-pound industry pushing her to believe that she’s not even meant to act out make-believe stories with boy characters in them.